Shabby Apple thought I was a good candidate to represent and so grateful they thought I was! I was given the chance to have one of their amazing dresses. I chose the Traveler. I was a little hesitant to get it, after all the model is skinny (not thin, skinny), has legs for days, and I, well...I have stumps for legs, and have curves I can't hide even if I wanted to. This dress is great for that- curves. 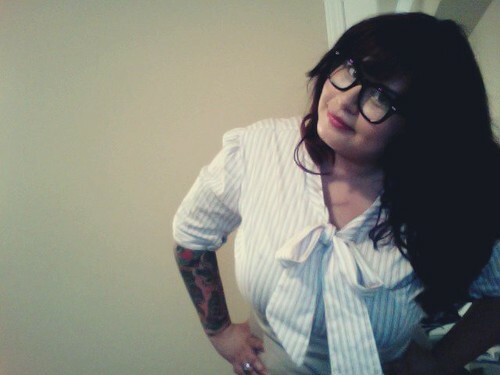 I felt like Joan from Mad Men, only with glasses and felt like I should be shimmying my way through a library again. They are also generous enough to offer one of their Summer dresses from the the Ooh La La collection, the L'Amour green dress. It comes in XXS to XL.